Most of the time being a self-emplyed freelancer rocks, but at this time of year it’s seriously lacking in the fun factor. No last day of working for you, no office parties and if you dare to take a few days off then you simply won’t get paid. There don’t even seem to be any official blogger Christmas parties this year , unlike last year when the Tots100 party was a right good laugh. Christmas party and it looked like this was the closest I’d get. However, as often happens when I leave the house, things went a bit wrong. The event was celebrating the launch of a new shower gel via the obvious vehicle of a cooking evening. I guess a mass-bathe in would’ve been unhygenic. 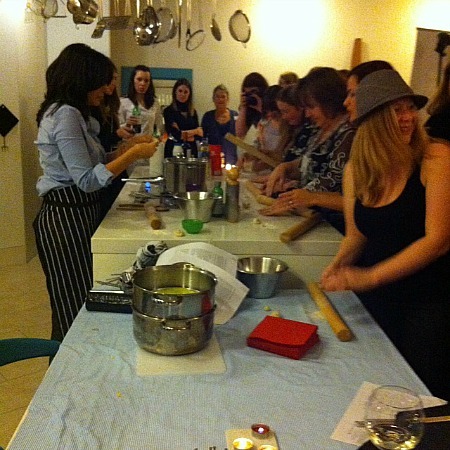 I don’t write about beauty products or food so was a bit surprised to be invited. Perhaps I had been asked because I am often in need of a wash. This I can’t deny. I decided to find my way there in true geek stylie aided only by the map on my iPhone – bad move. It took me on a circuitous route round London which involved dark alleys and parks full of men staring into the middle distance. By the time I arrived at shower gel party central, I was a nervous wreck. Then my name wasn’t on the list, confirming what I’d suspected that the invitation was a mistake. On the plus side, I was a bit sweaty by then, so a good candidate for shower gel. 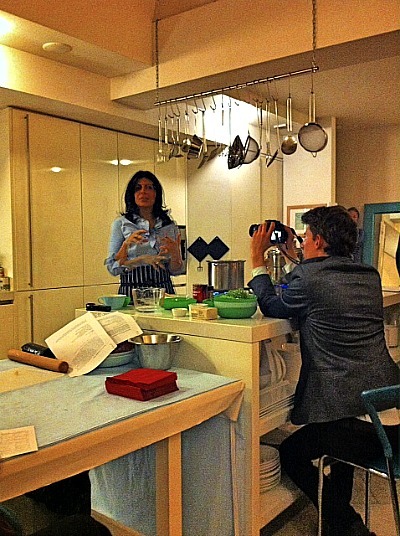 Star of the night was undoubtedly author and TV chef Anjum Anand. She was so incredibly calm and graceful as she cooked a meal for 10, filled us in on the thinking behind ayurveda and ignored the two photographers who kept sticking dirty great lenses at her, plus the dozen or so bloggers who were getting a bit giddy on the wine. She even let the blogging massive stick their tweeting claws in the food. What a hero! She’s my new ladycrush. 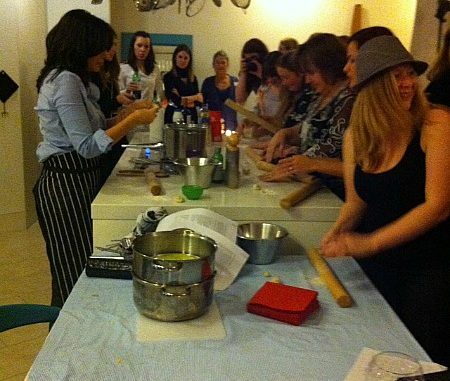 Anjum Anand made us Pea Cake, which sounds horrific but was actually flippin’ nice. And if you don’t believe me that Pea Cake is A Thing, here’s the recipe. And what of the shower gel, I’m sure you’re wondering? Well, it’s a new Ayurvedic-inspired range called Palmolive Ayuritel and the bottle is shaped like a fish. Although it looks like a ladyproduct the scents are actually fairly unisex so all the family can use it. It’s scented with stuff like ginger, mandarin and neem and called Joyous, Energy and Tranquility. (Why does nobody ever make a product called Meh? I would buy a crate). 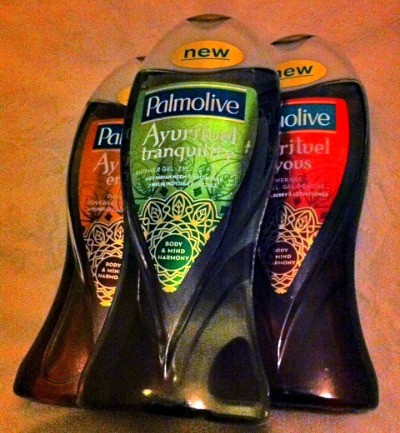 Palmolive Ayuritel is £2.99 from Sainsbobs. Meh would probably be pricier than that and do a worse job at keeping you clean. After the event I headed off into the night and once again the Marauder’s Map on my iPhone got me thoroughly lost, this time in the company of Dotty Dolly, a young blogger with fabulous swooshy hair who is cleary less in need of a wash than me. So: iPhone adventures, pea cake and shower gel. Clearly a night out to remember. I’m not leaving the house again for the rest of the year.